We students live the busiest of lives. Continuously running around from place to place, struggling to stay on top of our coursework, and doing our best to upkeep a social life as well; it becomes easy to get into a routine of class-study-eat-sleep, forgetting to take a breather in between. When it gets a bit much, a nice and easy way to get out of it for a while, is to simply leave your home and walk. Our small town, while we are hard on it from time to time, offers many beautiful locations to walk to or through, allowing you to cleanse your mind in the most peaceful of environments. Four of our fellow students have each shared their favorite walk to take whenever they feel like they just need a break. Taking walks is one of the purest pleasures in existence. There is something special about walking for seemingly no reason, simply observing your surroundings and allowing your inner thoughts and worries to coexist with the outside world. During a walk, one has the chance to reflect on everything, literally everything, and there isn’t, and shouldn’t, be any specific purpose to the walk. It is, in a way, similar to meditation. By allowing your mind to wander, your thoughts often fall upon the issues you unconsciously have been dwelling on. Taking walks is, however, also and foremost a very conscious activity, that forces you, by removing all distractions, to be alone. In Middelburg, walks are a simple delight. 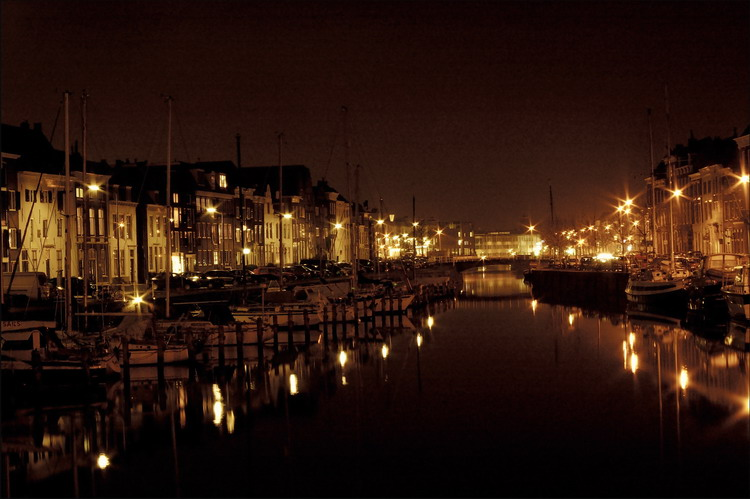 I would personally recommend taking walks at night, as Middelburg’s aura during the dark hours is one of the best I’ve seen. Walking by the canals, with the buildings reflected in the water and the stars above you, gives a sense of immortality. This might sound like a strange statement, so allow me to explain. The canals, to me, appear to be never-ending, as if the water and houses will keep following the road forever, just like the stars above. Near Bagijnhof, next to a canal, there is also a windmill I like to use as a reference point for my walks. Going for walks in Middelburg for me often means getting lost and then finding my way back almost by chance. That is perhaps one of my favorite aspects of Middelburg, as so many small streets converge to the same familiar spots, one can find the unknown within the known space every time. Middelburg holds a great mix of nature, architecture and other stuff. Although I highly value the nature and architecture, it is the other stuff that makes walks special. The other stuff is the way in which, when you pass by Amore, you’ll always cross a few students who have decided to sell their soul and stomach to the devil for one night. It is the way in which, if it’s still a little early in the evening, I decide to avoid Lange Noordstraat, as I don’t feel like bumping into any fellow students. It is how, after 20 minutes, I already feel like I’m out of the city of Middelburg and may get to Vlissingen in the next 20. It is the way in which I and the city embrace each other, and for a moment forget about our busy lives to observe, without judgement, how we are doing. Marco Segantini, Class of 2021, is a History, Philosophy and Religion major from Milan, Italy. I go on walks either right before bed or really early in the morning, because it helps me either fall asleep quickly or wake up faster! My favorite place to walk to is the Abbey square, which is super close to my Bagijnhof house. There’re these dramatic spotlights in the ground there that give the square a beautiful atmosphere. Especially on weekdays, there’s not a single person there and I just find it really relaxing with the sound of the fountain next to the square in the background. My favourite place to go for a walk is behind Roggeveen. The architecture there is very different from the rest of Middelburg, so it forms a nice escape from the UCR bubble. First, there is a long stretch of grass along a canal. Stairs go down to the waterway, houses lean over the water and every so often a playground for children pops up. The architecture is clearly thought-through to be a practical patch of green in the middle of the city. At the end of this long stretch, there is a field that looks more natural. The field is surrounded by a small hill, hiding the motorway that stretches behind it. I particularly like walking along this busy road in the dark, as the only light comes from the cars speeding by. Further along this path there is a tunnel that goes under the motorway and leads you out of Middelburg. At the edge of the city, it is so easy to forget about the stress and pressure of UCR. The road leading back to Roggeveen, passes through a wealthier neighbourhood, characterised by large houses announced by large front gates. I love this walk because it takes you through so many different areas of our small city, which makes it an easy way to forget about everything else for a while. Joelle Stocker, Class of 2020, is a Musicology and Environmental Sciences major from La Hulpe, Belgium. We, UCR students, live blessed lives as residents of Middelburg. The lack of nighttime activity and large streets invites you to walk and walk and reflect and reflect. Ever since I started to go on walks at night, I stuck to a route that I felt took me around quiet and meaningful stops. The tour starts from Bagijnhof: Heading towards Roggeveen, before going over the bridge, I take a left and walk for about 10 minutes until I get to a statue of a man who is sitting on the floor covering his face with his hands. As a good companion, I like to take a seat next to him and contemplate the stars until I get cold. This is a place I have taken many people to, we can all identify with those moments of defeat, but after showing them the stars above, it feels like an instant cure for anxiety and stress. Middelburg canals and streets are safe to walk through, absent-mindedly, lost in thought, reconsidering ourselves, exploring ideas; nevertheless, our legs will ask for a short stop sooner rather than later. The second stop on my route before heading back home is on the opposite side of the city: at the crossroads where you have Bachtensteene, Eleanor, and Franklin, you take a left towards Bachtensteene and go all the way down the street until you come to a fountain. The reason I like this destination is because of a number 82 on the facade of a building opposite the fountain. 82 is my superstitious number: I have pretended for a while now that if I go more than a week without seeing this number, I must be on the wrong path. Another reason I keep going there is because the fountain is on at night, and the bubbling sound it makes reminds me of a spa. I usually hang around here for 10 to 15 minutes, and with my eyes closed I imagine everything fading away: all my thoughts, my problems, my good memories are bubbles passing away, bursting and leaving space to breathe. Jorge Ortega, Class of 2020, is a Philosophy and Religion major from Chihuahua, Mexico.